3.3 out of 5 based on 35 bloggers and 9 commenters. 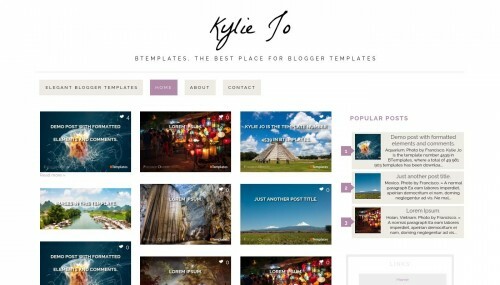 Kylie Jo is a free blogger template with 2 columns, right sidebar, gallery-styled, fresh look, minimalist, an exclusive design for Blogger, footer columns, posts thumbnails, well designed threaded comments, girly looking, simple look, neutral colors and pinterest style. Excellent template for blogs about any general topic, art, crafts, to write a diary, fashion, health and beauty, home and decoration, photography or a personal portfolio site. I need some help! I used this model, but I want to use with a 50% transparent background. In html code, where I change? Very thank you for attention. And you can apply the background to the element body, for example. This template works in every browser except in chrome. Only the left pictures are visible on the homepage and the rest disappears as you can see in the preview when you open it in chrome. I tried everything. Hope somebody knows how to help me. Thanks. This template works in every browser except in chrome. Only the left pictures are visible on the homepage and the rest disappears as you can see when you open the preview above in chrome. I tried everything, can somebody help me to make my website have the right appearance in chrome. I’ve downloaded and applied Kylie Jo to my blog, but it seems like no matter how many posts I want the main blog section to have, the section can’t be more than 6 posts. Can someone help me on how to make the main blog have more than 6 posts? I want it to be full like in the demo.